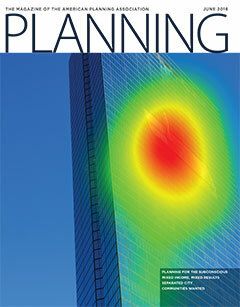 Planning probes below the surface with an intriguing cover story on planning for the subconscious. Authors Ann Sussman and Janice Ward explain how data obtained from eye tracking and other biometric technologies can help planners shape built environments that are interesting, pleasing, and informative for their human inhabitants. Developments that combine market-rate and affordable housing are common, but Craig Guillot asks how well that approach works. A pro bono program helps planners give back. By Marijoan Bull, Deborah Meihoff, and Robert Paternoster. Lee Epstein travels to Cape Town, South Africa — 20 years after apartheid — and finds a still- segregated urban form. We can use eye tracking and other biometric tools to better understand ourselves. Ann Sussman and Janice M. Ward report. The five most-cited planning researchers. The future of home ownership. Cover: Copley Square, Boston, eye-tracking test. Photo courtesy IHCD-Sussman.